TM versus AM; think (CLIP); resins that act as a molded product. 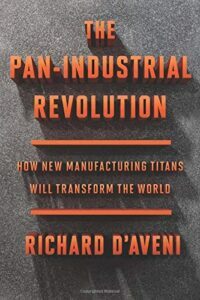 The industrial platform owners will eventually know so much about the manufacturing economy that they can create value purely through the information they control. One way they may do this is by creating information-driven markets for goods and services among the users of the industrial platform. The platforms may eventually resemble trading pits where members bid for designs, production capacity, or distribution contacts. Unlike commodity exchanges, however. industrial platforms will be private, and the platform owners will have unique access to the bidding activity. This will give them asymmetric information- knowing something that others don’t. They will profit not just from a percentage on all of the transactions, but also from selling that information, buying and reselling for their own accounts, and perhaps even trading on their unique information in stock and bond markets.